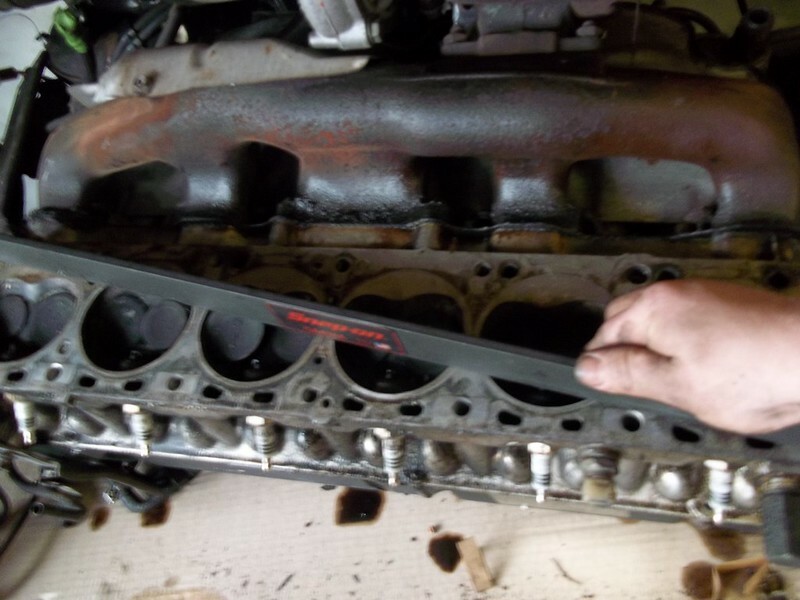 This is a "HOW TO - Check Cylinder Head/Block surface for flatness". Engine cylinder head used for demonstration = 1981-1983/Datsun/280zx/P7/P90/P90A cylinder head. Cylinder head material = Aluminum. 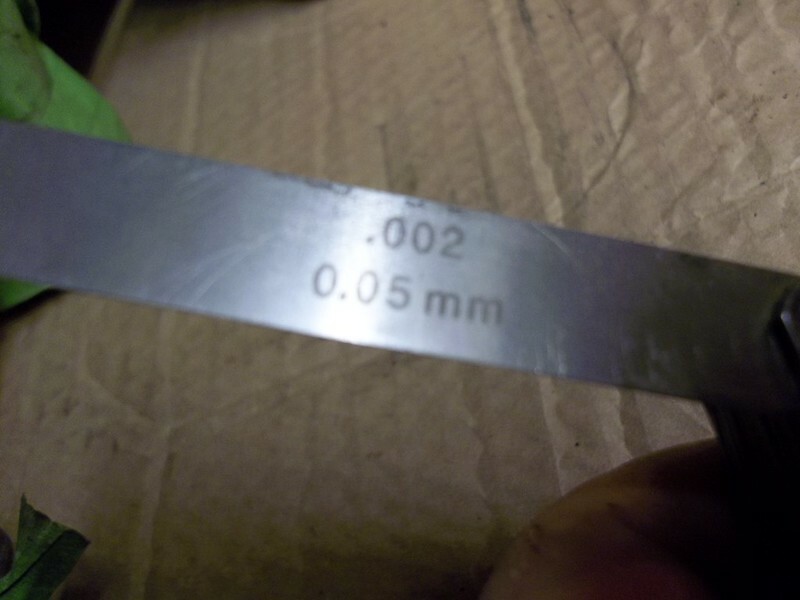 Flat-bar provided by = Snap-On. * Cylinder head to be checked. * A flat-bar that is in perfect condition for use. * A trusted , and verified repair manual for specifications for the warpage tolerances allowed. * A set of good feeler gauges. * A pen and paper to record measurements. * A very clean cloth (lint free) is ideal for wiping away , and checking several surfaces during the process. * A Very sturdy or stable work bench/desk/surface to work off of. * Good lighting whether it be natural or artificial. 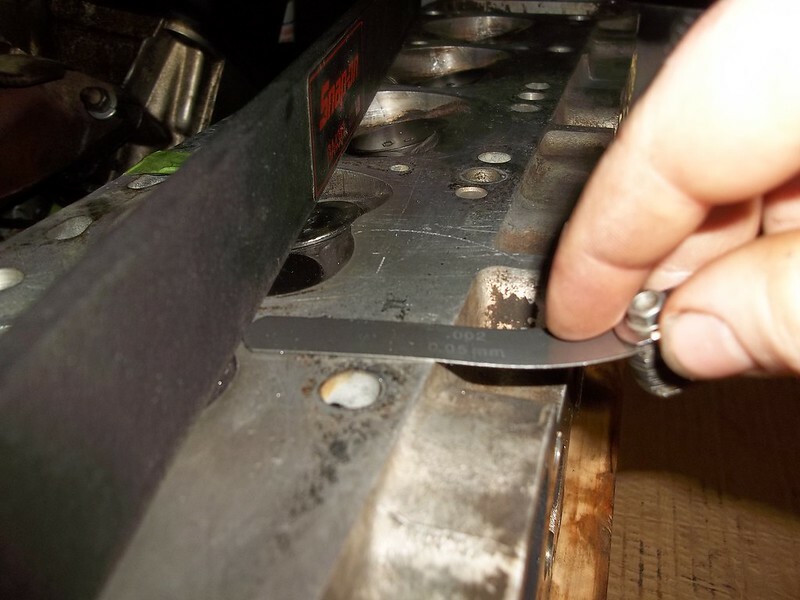 (STEP 1) --- You can go ahead , and drive down to most automotive/race machine shops If you don't want to pay for a flat-bar (a true authentic one). 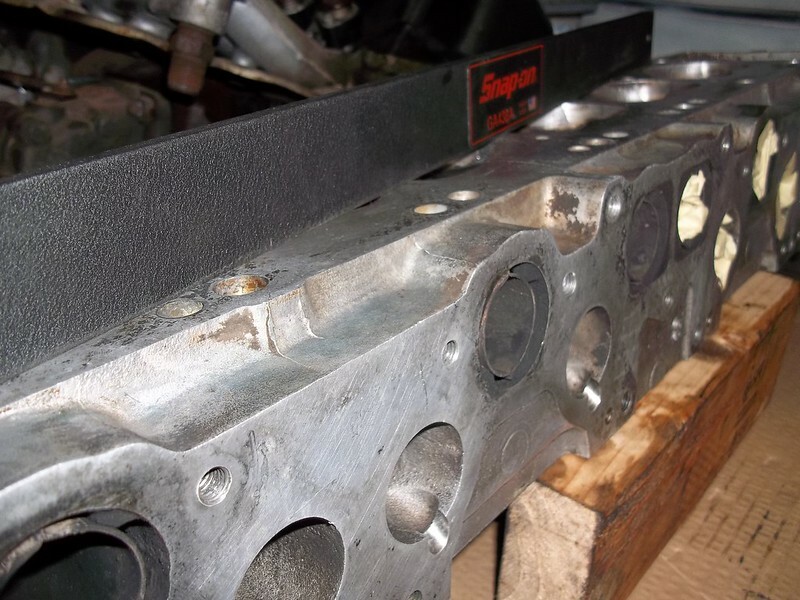 Many shops will check your cylinder head , and sometimes (depending) block for free. They will also generally charge for a pressure check , and mill (which are both great ideas if needed or suspected it's needed). At this time it's a good idea to get a quote for everything you MIGHT believe you will want to have done or potentially. 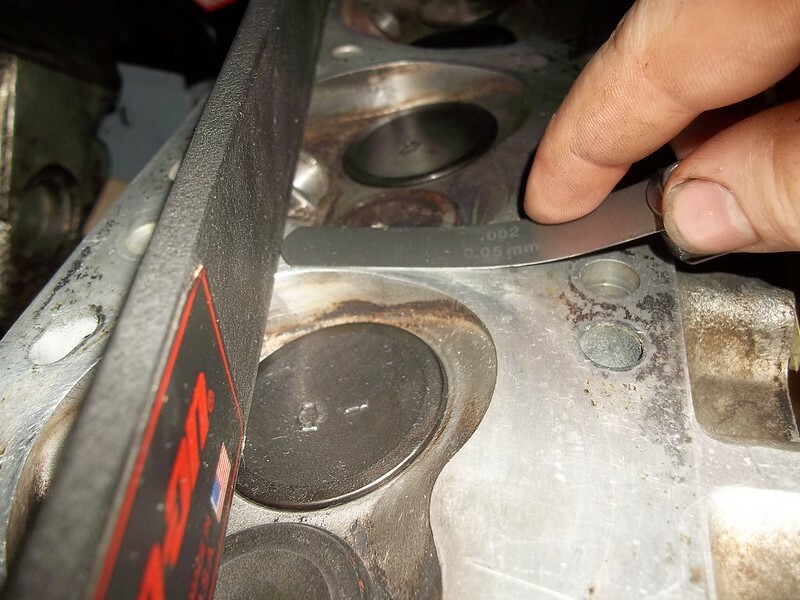 (STEP 2) --- Make sure your cylinder head sealing surface is clean/clear/free of all head-gasket material , and debris. The flat-bar should be very clean/protected/and ready to be used as well. 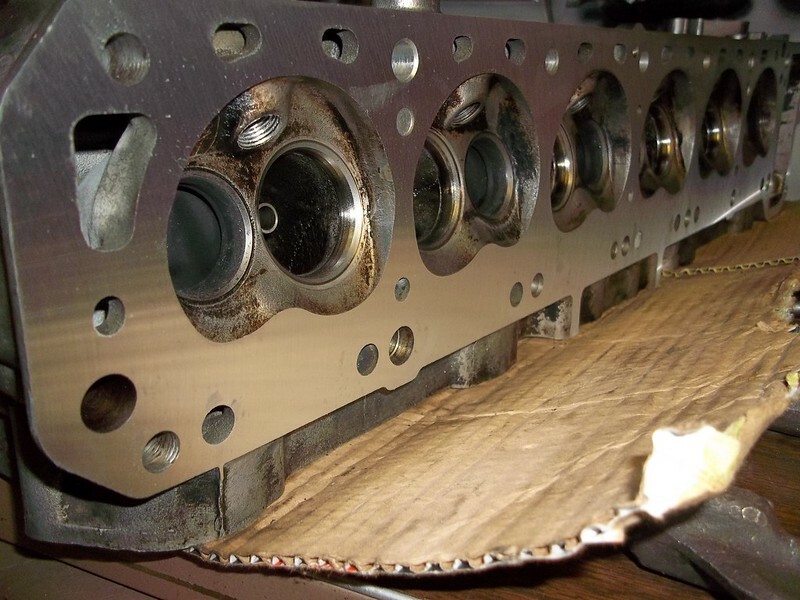 What is seen in the photos is evidence of the old head gasket "biting" into the aluminum material , potentially old machining , cleaning marks , and possibly some un-scuffed debris that should be cleaned prior to the process. (STEP 3) --- You'll want to carefully turn your head upside down , so that the head-to-block sealing surface is facing up towards yourself. This is just the easiest way to do it with one person for me at least. Not totally necessary. Notice the cam towers are in the center. I used a block or a chunk of 2x4 to keep the head somewhat relatively level. VERY IMPORTANT to note that the flat-bar is positioned diagonally along the head not paralell when checking. I also personally check paralell at the end of the process to see if there was any variance between the two measurements for any reason (can't hurt , but not totally required to my understanding). (STEP 4) --- Grab your Repair manual or Factory service manual. 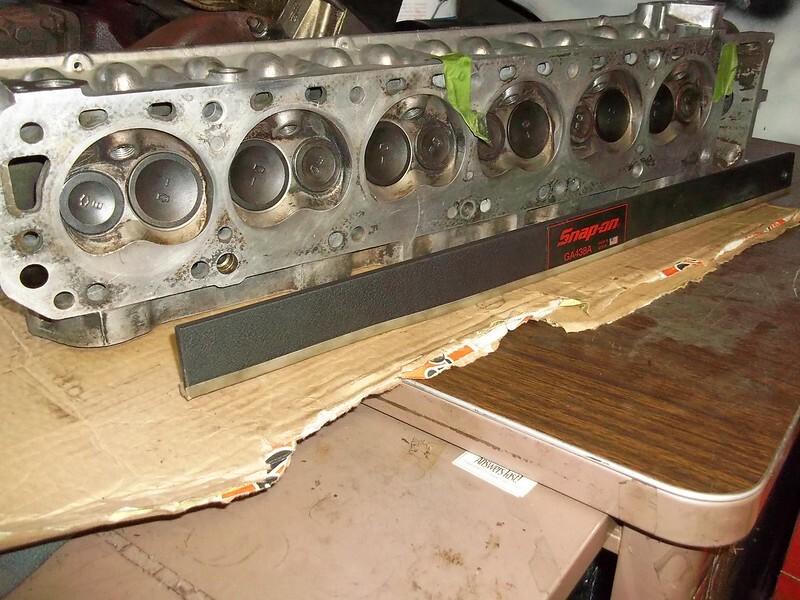 Find the cylinder head warpage allowance/tolerance/measurement allowed. I started with a feeler gauge that was half of the allowed tolerance roughly (when converting from metric to standard = rounding). In this case is .002 . You're could be very well different especially if not a Datsun at all. It's always important to know , and check for certainty ! (STEP 5) --- What you're doing next is simply applying light pressure on the flat-bar whilst trying to slide the feeler gauge up under neath the flat bar at every point along the bar. Especially between cylinders. Remember to have the flat-bar positioned diagonally when performing this. At the end you can check with the flat-bar parallel as well. Carefully take your time at each stroke. 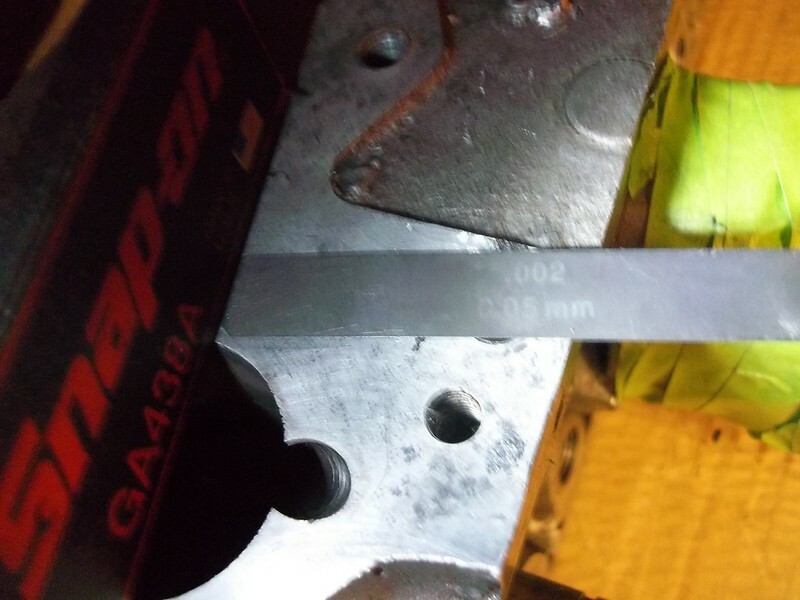 If the feeler gauge slips under without any resistance it means you need to go to the next largest feeler gauge , and try it in the same spot until it either drags heavily or will not go up underneath at all. 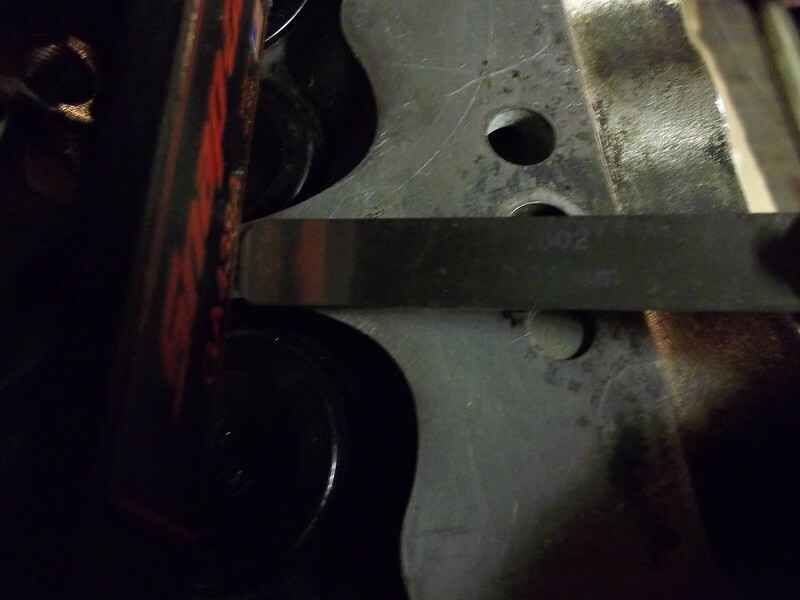 The feeler gauge that slips up underneath .... the flat bar ... and is the largest .... is close to the amount of warpage in the cylinder head. This is why it's good to know what the allowed warpage limit is before machining is needed. Record your findings along the way especially if they vary greatly or if you have to keep using larger and larger gauges. Take your time it's not a race. 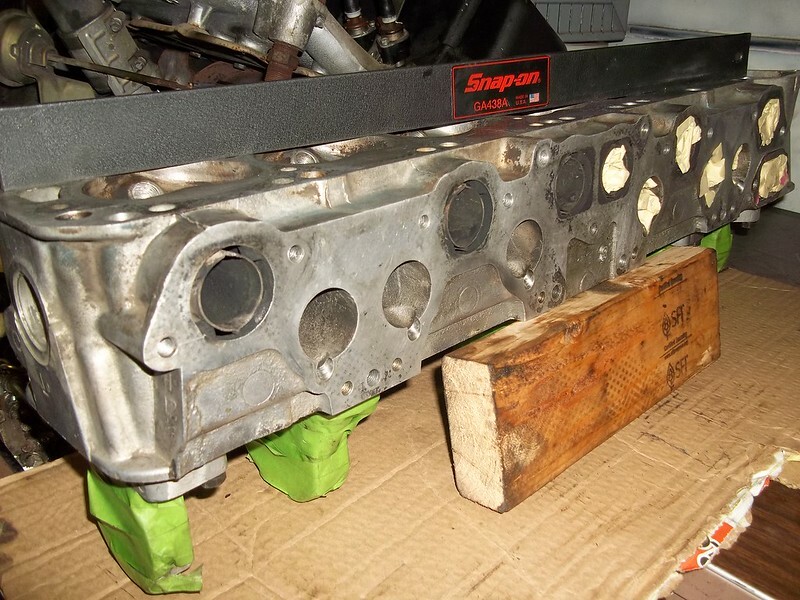 (STEP 6) --- You can check the intake/exhaust manifold surface , and cam tower surface (after careful dis-assembly of course , pulling out the dowel pins in these specific heads as well). 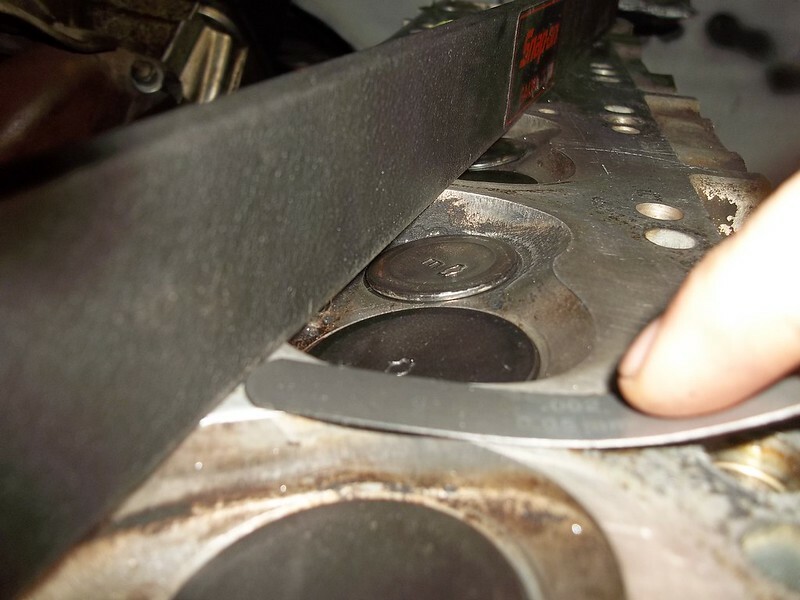 The cam tower areas are typically checked if the cylinder head has been severly over-heated. All (3) surfaces combined in measurement will let you generally know whether to pursue or not pursue your repair. Machinists are willing to machine the intake/exhaust as well as the cam tower area flat again. I would caution you want someone that knows these engines well before the service is performed. Here is some additional photos for visual reference. 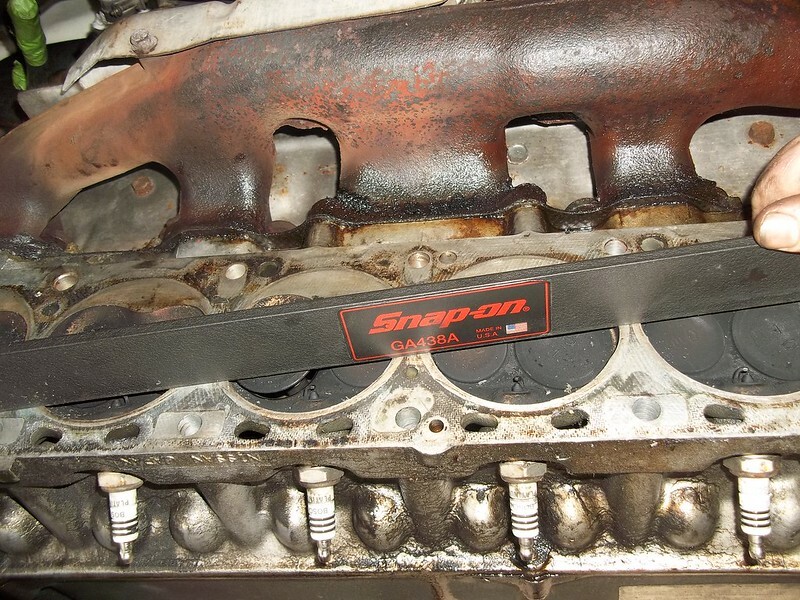 Intake/Exhaust gasket surface is perfect. 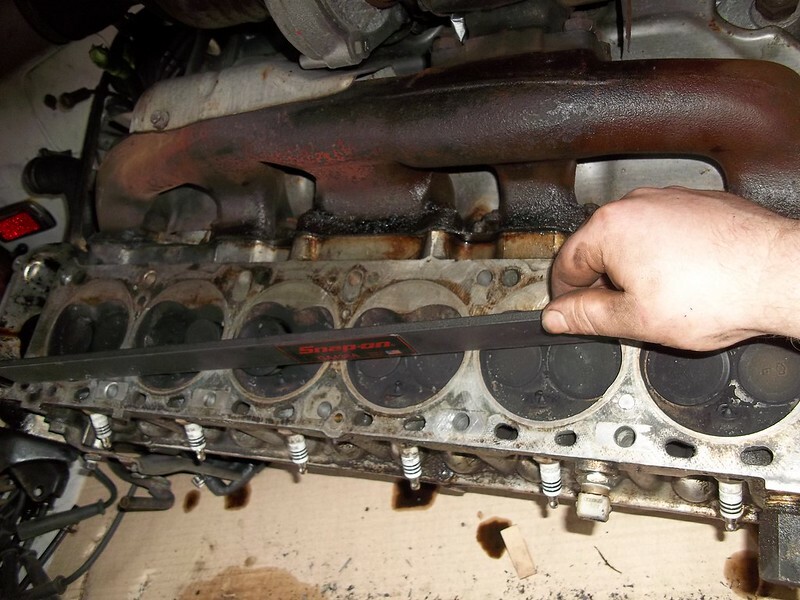 For my particular cylinder head that was used for this demonstration. 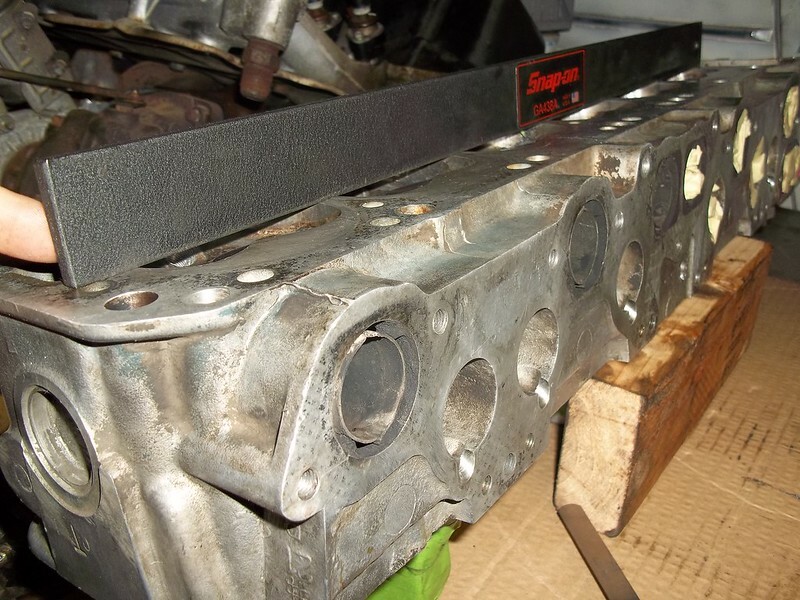 I felt it was best to get the cylinder head-to-block surface milled flat while I was putting the work into the rest of the engine (pictured below). I also had it pressured checked while there for a per-cautionary measure. Even though it was within warpage spec allowed.